Tell Amy you want to schedule your PRECISION STRIKE session TODAY! Your customized evaluation, hitting or pitching training will take approximately 3-4 hours. If you decide to do both hitting and pitching, you can count on being here about 5 – 6 hours. A full physical assessment by Randy Sullivan, a physical therapist specializing in the management and development of throwing athletes. You’ll learn what you need to do to increase velocity if you’re a pitcher and increase hitting power if you’re a hitter. High-speed video biomechanical analysis and classroom education on the essence of safe, efficient and powerful throwing and/or hitting mechanics. One-on-one hands on training for all assigned corrective throwing drills. Hands-on training for physical corrective mobility/stability exercises. A 21 day written individualized, multi-dimensional training plan for you to continue what we started in your pitching training and hitting training with us – This will help you increase hitting power, increase velocity, master hitting and pitching mechanics, and so much more! Video links to: all throwing drills and/or hitting drills, corrective exercises, power building workouts, warmup routines and recovery e-book to ensure complete follow up and continuity. Arm care routine and one Arm care kit (connection ball, 7 oz weighted ball and Durathro training sock) from a physical therapist specializing in eliminating arm pain in throwing athletes. 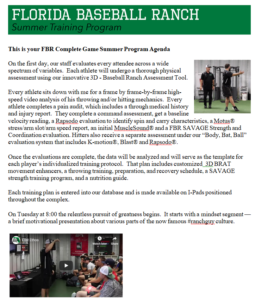 An FBR Strong/SAVAGE weight lifting session based our revolutionary book FBR SAVAGE Training: Transferring Gains From The Gym To The Game. Rapsodo spin rate assessment and pitch design training.